TV’s Ghost Adventures, Ghost Hunters and other programs have featured this historic hotel, which is said to be rich with paranormal activity. U.S. 95 & Columbia St. Ya wanna know bout this place? I lived in Goldfield. Im Not kidding…. Fb me if ya need info. I’ve been to the Hotel a few times. I’ve investigated it a couple times. Slept over night in it once. The basement is where hell is located. Something sinister and wrong, just plain wrong is in there. It lives and breaths in the walls. In the foundation. In the air. It is the darkness…the dark mass of the underground. 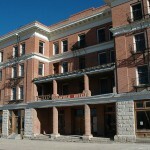 Back in 2009, my beat friend and I experienced the demons under the Goldfield hotel. We felt it’s wrath. We could feel it’s breath against us. The place breathed as if it were alive. The walls moved and ground shook with every breath. It exhaled anger and chaos. What began horrible ended wonderfully. Not too many can say that about Goldfield Hotels basement. We actually danced with spirits and laughed with them. We could hear with our ears funny remarks and laughter. They said they were sorry for doing what they did to us. I have photos of what I believe is “Elizabeth” by room 109. It’s a young girl in a pose holding back her hair with one arm over her shoulder in mid step wearing a sun dress…like she’s twirling or dancing. The other photo is from the basement where something is walking upside down and grinning looking at the camera. The film is Iin Infrared so we didn’t see it…bit it was seeing us. It’s pitch black under there! Hit me up at dark slide paranormal on Facebook. The photos are there. I know Rachel who lived in goldfield. She can also share a few stories. This hotel is probably my favorite haunted place! Any big ghost adventures fan can recall the brick being thrown and not just that but one of the clearest EVPs ever were captured in this hotel.